An American River College student refills a water jug with at a new refill station in Davis Hall. Five refill stations across campus during spring break and ARC will install more around campus in the coming weeks. (Photo by Itzin Alpizar). 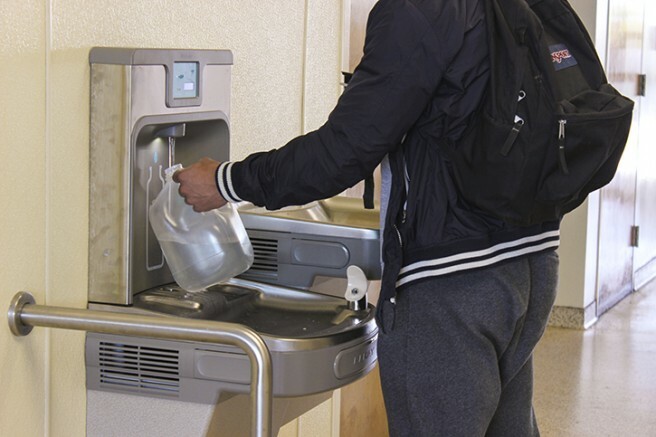 Five filtered water bottle refill stations were installed around the American River College campus that will save a minimum of 16,000 plastic bottles and $28,000 from the students’ budgets per term, according to the website of the company who makes the stations, ELKAY. Two stations each were installed in both the Kinesiology and Athletics department and Davies Hall, while one was installed in the Administration Building and one is being finished up in the Student Center. “There are going to be between 10 to 12 units on campus,” said Don Reid, the sustainability representative of the Buildings, Grounds and Safety Committee. Each station works with a wireless sensor, and when the water container is put underneath the sensor it dispenses water. Each station also has a display that shows how many bottles they have saved. The water from each station is filtered water, in comparison with the tap water coming from the drinking fountains. The units are called ELKAY ezH20 and according to their website, they are easier to change the filter, they’re energy savers and they come with a smart system that can help the maintenance department to monitor all stations to keep track. They also have easy installation, and use low-energy LED light. The stations were purchased after Reid’s presentation to the Associated Student Body Student Senate at the end of the spring 2015 semester, which in cooperation with administration Vice President Ray Du Giulio awarded Reid $20,000. Reid said he walked around 60 drinking stations around campus and suggested the better 20 candidates to him based on traffic. Director of operations Dan McKechnie helped to make the process more fluid, choosing the best ones, and the District Office Facilities installed them. “The spots were chosen by the most cost effective option where they don’t have to tear the walls and don’t destroy much on campus,” said Reid. The $20,000 was spent on the cost of the stations, valued between $1,000 to $2,000 each, along with replacement filters and the labor to install them. Reid said that putting in the stations was a big process that took five full days during spring break. The remaining units will be installed during the next few weeks. ARC student Courtney Boyle said that she uses the unit at Davies Hall all the time to fill her water bottle. ELKAY’s website has an environmental impact calculator available to all students to know the amount of money and plastic water bottles saved during a school year. According to the environmental impact calculator, based on the amount of bottles saved by students on each unit, an average 1,000 bottles a week and approximately $8,000 have been saved from the students’ budgets and a total of 166.67 pounds of plastic were saved. With the impact that the last purchases have done for the sustainability on campus, Matthew Blevis, operations technician of administrative services, said these changes will involve students in the goal of saving the environment. 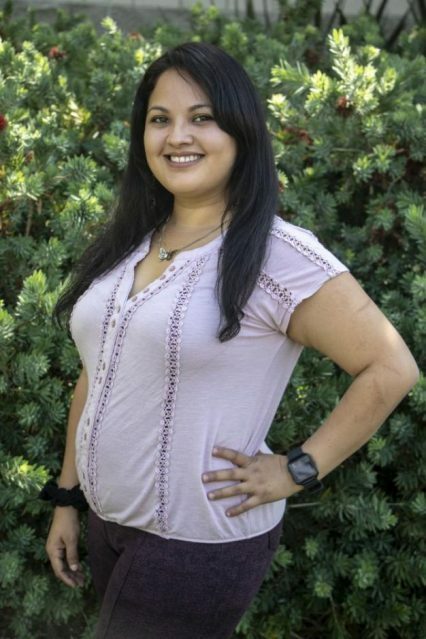 “Eventually we are going to work to see that sustainability is a campus life thing, so not just kind of individual or whoever is interested in the subject, but for all,” Blevis said. Be the first to comment on "Filtered water bottle refill stations installed at ARC"